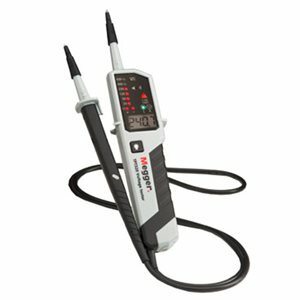 The Megger TPT320 voltage tester provides electricians and electrical engineers with voltage indication but has additional functions / features that makes the instrument a versatile instrument. The TPT320 features both LCD and LED displays that provides AC and DC voltage measurement from 12 to 690 volts, in addition, a continuity function ranging from 0 to 500 kΩ. Continuity and voltage measurements greater are accompanied by an acoustic sounder.